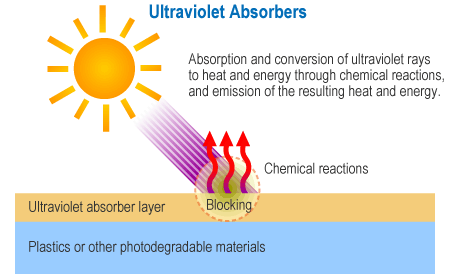 Ultraviolet Absorbers | Chemical Products | Products | Otsuka Chemical Co., Ltd. The ultraviolet rays found in sunlight and lighting cause photochemical reactions when they make contact with plastic. This has a dramatic effect on such essential physical properties of plastic as color and strength, causing degradation. Ultraviolet absorbers are one of the additives used to prevent plastic characteristics from deteriorating in environments where ultraviolet light is present. Ultraviolet absorbers protect materials by converting absorbed ultraviolet rays into low-impact heat and energy through chemical reactions. Ultraviolet absorbers are mainly used to curtail photodegradation in plastics by playing a key role in suppressing the generation of radicals that cause plastic to degrade. This is a benzotriazole-based ultraviolet absorber with reactive groups. It is optimal for use in paint or film that requires thermal resistance and long-term stability. Ultraviolet absorbers are one of the additives used to prevent deterioration of the characteristics of plastics in environments where ultraviolet light is present.